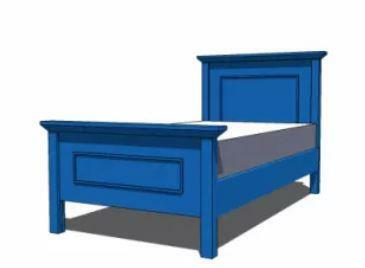 Choose from the many free woodworking plans available for a child's bed including race car bed plans, trundle bed plans, 4 poster bed plans, and children's platform bed plans. It's easy to get a child to go to bed when they have a special bed all their own. 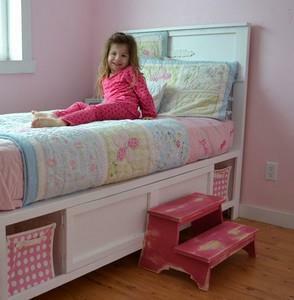 Build this sweet and charming child's bed with storage. It features an attached headboard and footboard and exposed bench feet. The 4 cubby holes are perfect for storing books and nighttime items. 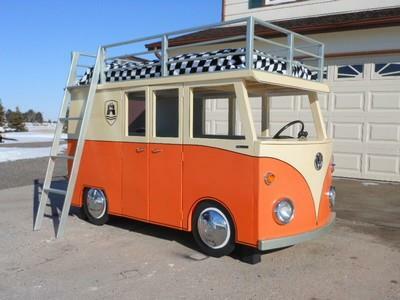 Here is a plan for building a mini bus with a bed on top with safety railing and room inside the bus for playtime. You can easily create this twin bed with a tall headboard and matching footboard by following these six steps. Create a loft style bed that looks like a club house with attached stair steps and two windows, plus floor space underneath. Is your child outgrowing their crib? Then they need a toddler bed. This toddler bed is incredibly easy to build, is very sturdy, and cost around $35 to build. 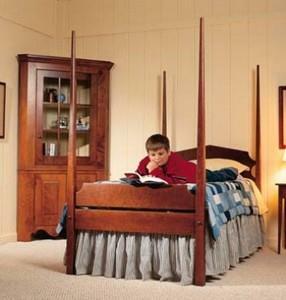 A sturdy 4 poster bed that is simple to knock down into parts for easy handling. 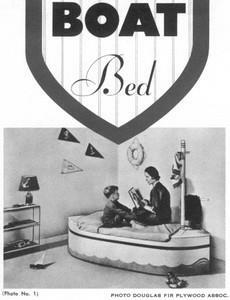 Going to bed can be a game for junior if you build this boat-shaped bed. There are lockers with hinged tops at each end for storage of toys and other belongings. 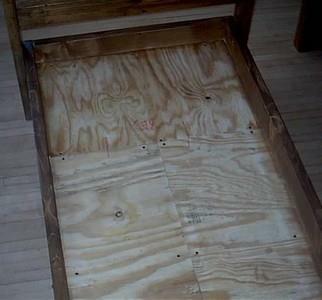 In the section under the mattress, there is additional storage space for blankets, bedding, etc. The mast makes a convenient clothes hanger. 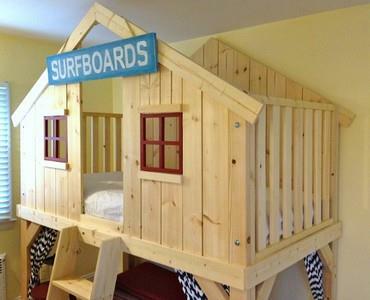 This toddler bed is incredibly easy to build, is very sturdy, and cost around $35 to build. Complete step by step instructions for a child's Scandinavian bed.